When it comes to custom design, we have worked hard to develop a reputation for unique and distinctive jewelry. 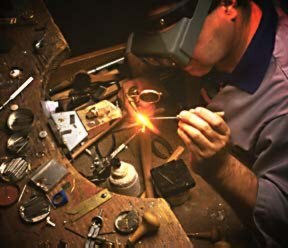 If a client does not find exactly what he or she is looking for within the exclusive jewelry collections on display, or if a client wishes to redesign that out-dated or worn-out piece of jewelry into something new and exciting, our professional staff will help design that special one-of-a-kind piece! Fabrication: Your design will be made by our exceptionally talented goldsmiths who have the ability to make your dreams come true by creating or recreating your design in 14K, 18K, platinum or sterling silver. For example, if you brought in an engagement ring that didn’t quite lend itself to be worn with most traditionally styled wedding bands, our design staff is able to help fulfill your dreams by designing a wedding band that perfectly fits with that engagement ring to complete your wedding set look. Bring us a picture or let us draw you a one of a kind design. Our jeweler will hand carve a wax mold that will become your custom jewelry. You make a visit to approve the wax carving. Leave the work to us! In a few days we introduce you to your custom keepsake design. Gemstones: We always have a fabulous assortment of loose diamonds and gemstones in all colors and price ranges. Don’t hestitate when deciding who to trust with your precious creation. We aren’t satisfied unless you are! Let us help you design exactly what you envision or even bring your masterpiece to life! Custom Logo Work: Let us turn your corporate logo or symbol into something special! Whether you’ve got a design already or need us to put one together for you, we can satisfy your every need. The workmanship of our finished product is our good reference, so we’ll make sure you are pleased with your new piece!